It will soon be that time of year again, as the days grow short and the nights warm up to candlelight, good food, family and cheer. The season of high hopes (and high anxiety) is also the time when music fills the air. 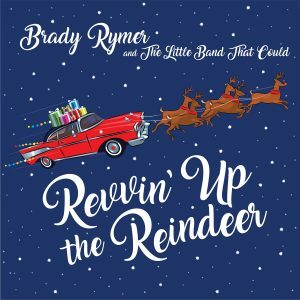 This year, three-time Grammy nominated and nationally touring Brady Rymer and the Little Band That Could releases a fresh album of 13 cheery, all-original holiday songs, Revvin’ Up the Reindeer. Brady’s music echoes holiday classics with exuberant instrumentation and arrangements. In their ninth album for families, Brady and his band reflect the festive jumble of the season, with caroling harmonies, brass and bells. Every track is inflected with the band’s rootsy, feel-good sound, recalling beloved seasonal standards yet with Brady’s distinctively fresh and engaging style. The title track is a 50’s rock ‘n’ roll romp, imagining Santa with a souped-up sleigh; the ska-beat “Holiday Jam” is a humorous take on the many ways we cope during the busiest time of the year; lyrical accordion embellishes the Klezmer-inspired “Rainbow Candles;” the hopeful sing-a-long “Christmas Wishes” radiates with a children’s choir “The Fa La Las;” and the band rings out the old and swings in the new in raucous, Dixieland jazz fashion with “Baby New Year.” Indeed, whispers of holiday standards weave cleverly throughout, conjuring up the magic of the holiday season.